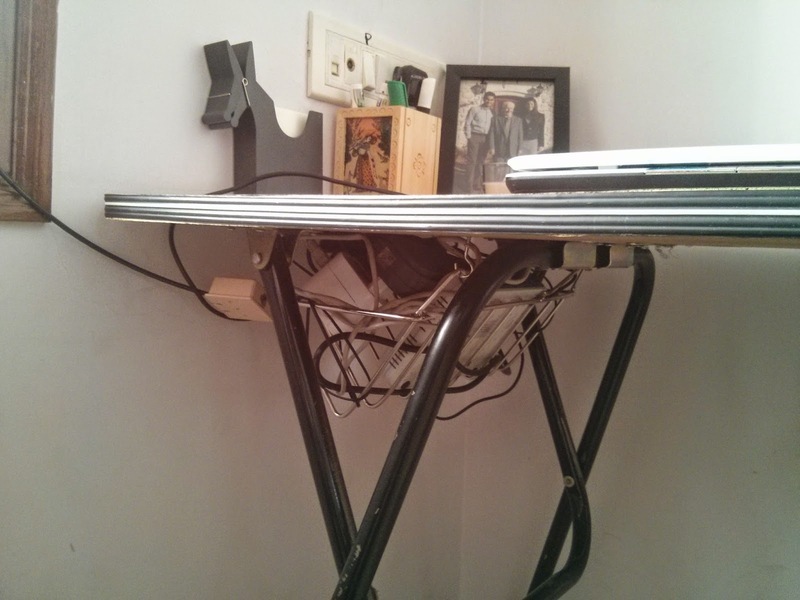 Jugaad Freak: Get rid of those cables !! 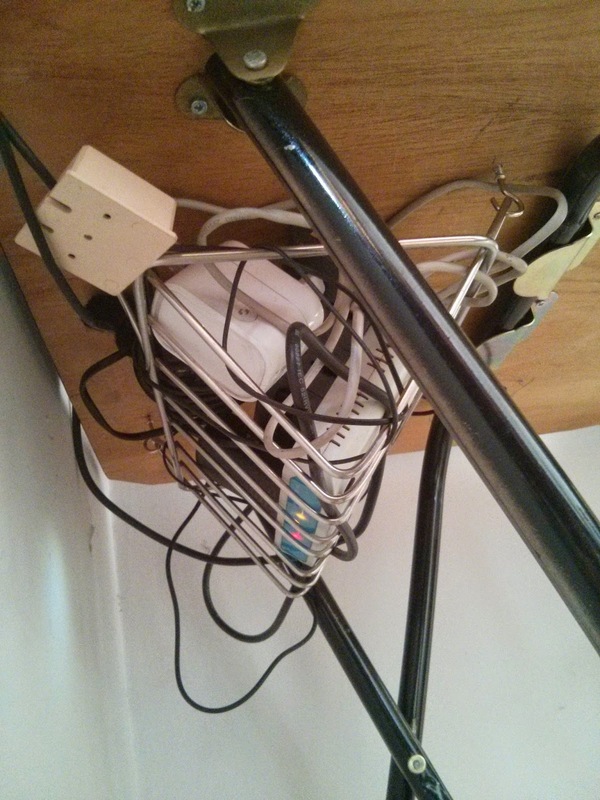 Do you also hate to see your wifi router and cables invade your working space ? I certainly do, so I had to find something to do with those unsightly little devils!! I had initially put them in a shoe box which I'd covered in cloth, left that on the table... It helped improve the aesthetics by hiding it all away but didn't solve the space issue. Then as I was strolling in one of the china bazaar shops near my home (one of my favorite pastimes), I had a eureka moment when I saw the plate stands. Of course this would do!! I'd just have to fix it under the table and throw all the electrical junk in it ! Naturally this isn't the primary purpose of plate stands, but hey, so what?! It serves the purpose - doesn't collect dust, multisockets and chargers would be easily accessible and that wifi monster would stay right where it belongs, out of sight ! So I went to get 4 hook screws at the hardware shop, went home and got to work. 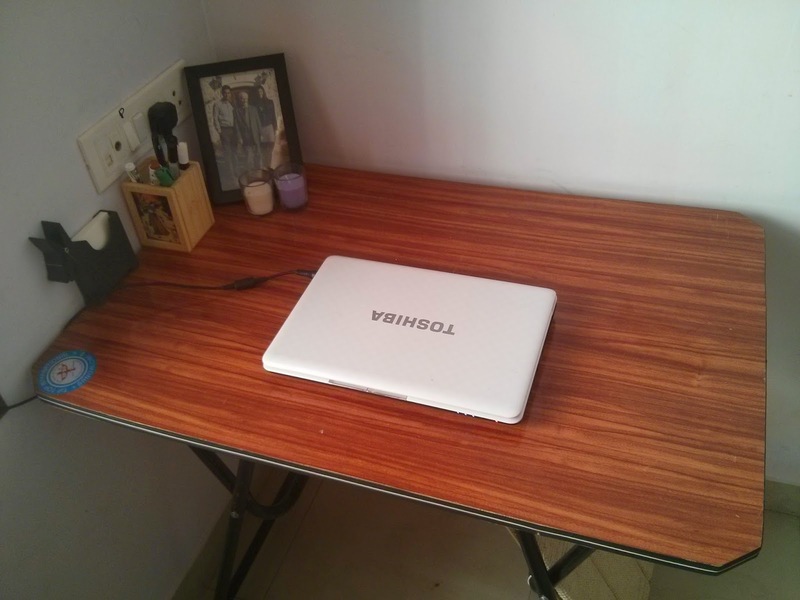 As a result, no more cables in my sight, all over the desk, and my leg space is also left untouched yay ! (if you're a tall person who likes to cross legs under the table like me this is a major plus point !). BTW, total bill ? 100 rupees for the plate stand (and I probably got ripped off because I'm a firang) + a few rupees for the hooks... That's it ! I have used a plate stand to corral flip flops around the house. As you know we call them Havai chappal in Bangalore. Another thing that l have done is instead of placing my plate stand in the kitchen cabinet,I have fixed it to the back of the cabinet ,up onto the wall. So now I can wedge in my chopping boards,trays, chapati rolling board etc. And they stand erect without toppling over all the time.